I find maps really useful for solving genealogy mysteries. For example, "Which is most likely to be the marriage or christening of my ancestor?" A few years ago I read a Dear Myrtle's Blog posting that explained 'the 7 mile rule'. In rural areas in the 1800s, a young man had farm chores to do. He might get a few hours off to go courting, but he needed to be home in time for the evening chores. His usual mode of travel would be on foot, where his speed would be about 2.5 miles (4 km) per hour. This means that he usually had to find a bride within a distance of roughly 7 miles. So if the young man lived in a known location, his sweetheart probably lived within a 7 mile radius, and probably close to one of the few roads connecting the two points. In reality, we know that love is not completely confined to elementary cartography. In some places there were other modes of transportation that would expand the range. In fact my grandmother lived in London, England, when she accepted a marriage proposal (by letter) from my grandfather who lived in western Canada, nearly half a world away! But generally the 7 mile rule is a useful guideline. I often use Google maps (https://www.google.ca/maps or https://maps.google.com) to determine the distance between two points. The fact that the birth takes place in one county and the marriage of someone by that name occurs in the same county does not tell me how close the two places are. I need a map. I frequently use Google maps for that purpose. It is instantly accessible, and clicking Directions allows me to put in the names of the two places, to automatically calculate the distance and route between them. But Google maps show an area as it is today, not as it was in 1863 or some other time in the past. This is where old maps really shine. On a recent podcast, Lisa Louise Cooke spoke about old maps and recommended a site http://www.oldmapsonline.org/ I like checking out old maps. Most of them seem to be in areas I am not researching, but sometimes I get lucky. The first thing I noticed was a 1948 map of Alberta, including many places that no longer exist, and are probably omitted from online maps! You may find the old maps useful too. Today I have a guest blogger! Researching your family history can teach you a lot about your ancestry. It also makes a wonderful gift once you have completed your research. Give it as an anniversary present, birthday gift or for other special occasions. If this is your plan, you need to begin early, especially if you plan to go in-depth with your research. You have numerous options for how you want to create your family tree. You may want to select a template that covers three or four generations related to the recipient of the gift. This option will have special meaning since the person already knows the people listed. You may prefer to be more historic in your approach and select a ten- or eleven-generation family tree template. This option makes for a wonderful gift that will appeal to many people. Just be prepared that the research could take you several months so play far ahead if this is the approach you choose. Another option is to take smaller templates and create multiple family trees. For instance, you may decide to cover the ancestry of all of the person’s grandparents. You would create four separate templates that could be placed together in a large frame. You would probably select three- or four-generation templates to ensure that everything fits in the space and isn’t too overwhelming. Once you know what kind of research you will need to do and how much information you want to present, you need to decide on the format. Numerous options are available to suit many tastes. A landscape family tree template is a classic choice with ovals where you can put either information or photos. Bowties and wide or tall trees are other options that are ideal for three- or four-generations. They often allow you to include photos or more information other than just the names to personalize your design. For more in-depth research, you can also use the bowtie design. You may also want to try a circular pattern to fit more names into the space. A chart format is another option when you have a lot of names to include. It is easy to read and keeps everything organized. To be more decorative, choose a template that includes a border. You can even find ones that allow you to input the family crest. Give the family tree as a wedding or anniversary present and include both families of the couple on your template. A bowtie design is the ideal choice for this gift and is easy to read. When giving a gift of a family tree to someone, you want it to be visually pleasant to look at and easy to follow. You may want to include photos or more data to create a gift that is interesting and will have meaning to the recipient. This is both a unique and heartfelt gift that you put a lot of time and effort into. Choose the right design for your gift that fits the information you collected and puts it into a lovely display. Suzie Kolber created http://obituarieshelp.org/free_printable_blank_family_tree.html to be the complete online resource for “do it yourself” genealogy projects. The site offers the largest offering of family tree charts online. The site is a not for profit website dedicated to offering free resources for those that are trying to trace their family history. My Observations: The ObituariesHelp.org site has a huge array of different templates (patterns) for displaying family trees. For example, one of them is for adoptees to include both their adoptive family's pedigree and their birth family's pedigree. I am not sure I have seen that before! These charts can be an attractive way to display your genealogy. My genealogy software has a few basic charts, but nothing like this! To use one, download it, open it in Adobe Reader, click Sign, change the type size to something larger (maybe 14 or 18), click the space where you want to add text, and add the information. Then print it out on your printer. Copies of the filled-in chart can be saved for sending by email, or for printing later. Disclaimer: I have no connection to obituarieshelp.org and do not specifically endorse the companies advertising on their website. But I find the templates interesting. Suzie, thank you for your posting. I have a family heirloom to give away to any of Louisa Ing's descendants. 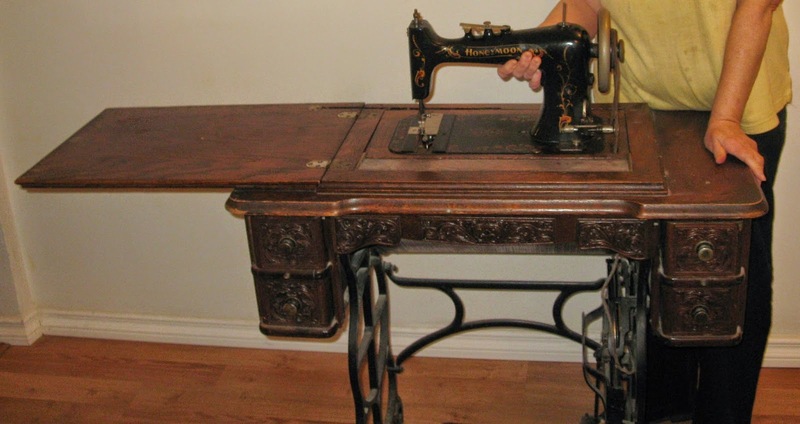 It is Louisa's old sewing machine, a treadle-powered Honeymoon machine, that could use some TLC. On this sewing machine, she created and repaired the clothing for her family, often by the light of coal-oil lamps. Her children are now great grandparents, and in some cases great-great grandparents. A few months ago Judy and I sold our acreage home and we now live in an apartment in James and Karin's house. We got rid of tons (literally!) of stuff, but I couldn't throw away the old sewing machine. We have no place for it, and I would like to see it remain in the family, if possible. 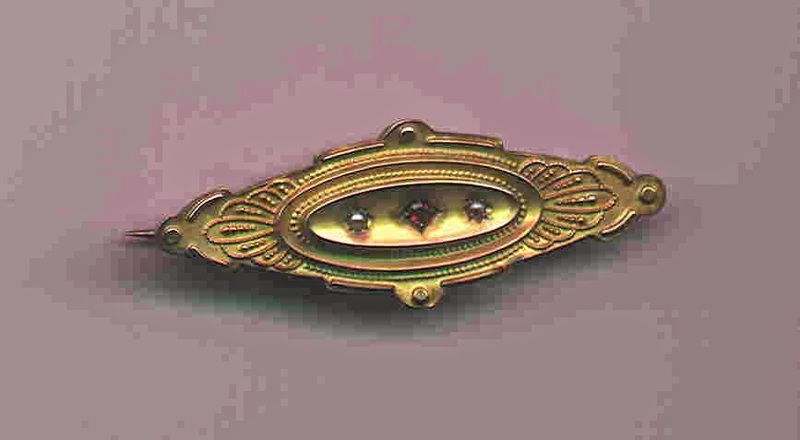 Before their marriage in London, England on February 22, 1880 Samuel Wright gave a special brooch to his fiancee, Charlotte Harriet Eley. Charlotte was wearing this brooch when they were married. Later, Charlotte gave it to their daughter Louisa Ellen Wright when Louisa left England to marry Richard Samuel Ing in Canada. She was the second generation to wear the brooch, when they were married in Macklin, Saskatchewan, on 6 Jul 1913. She passed the brooch to their daughter Dorothy May Ing. When Dorothy married William George Buchanan on 22 Feb 1941 at Winfield, Alberta, Canada, she was the third generation of brides wearing the heirloom brooch. Dorothy passed the brooch to her eldest son’s fiancee Judith Marlene Kinney. When Judy married William Richard Buchanan in Raymond, Alberta, Canada on 23 Mar 1968 she was the fourth generation wearing Charlotte’s brooch. When Bill and Judy’s daughter Laurel Rae Buchanan married Christopher West Layton, she was the fifth generation of brides wearing the special brooch. In a few week's time Laurel's oldest daughter will be the 6th generation of brides wearing Charlotte's brooch on her wedding day. We hope that there will be future generations of brides in our family wearing this special family heirloom. This heirloom means a lot to our family. We have had it in the family for over 130 years. Through this brooch we feel a part of these ancestors. It has helped us to feel connected to them. This brooch has been a common link that has united our family across the generations. I’m thankful for our ancestors and the heritage they have given us.